The FEI Nations Cup series is equestrian sport’s oldest team competition, and that is not lost on me. I may be a “Millennial” by birthdate, but I have a lot of respect for the great history and tradition entrenched in show jumping. My latest broadcast foray brought me to the beautiful Thunderbird Show Park in Langley in “Beautiful British Columbia,” according to the license plates. I won’t disagree. Tbird is truly one of the most picturesque venues on the Longines FEI World Cup Jumping North American League, and I was happy to make an additional trip out for the venue’s very first five-star in its 45-year history. “Tbird” is not your average venue: While growing and improving by leaps and bounds, it is also, as President Jane Tidball says, “a boutique horse show” in that it caters tremendously to individual need. Please take it from me. Tbird treats everyone like family. Tidball herself can be found stomping divots in the grand prix field, while it’s not unusual for Chief Operating Officer Chris Pack to drive the water truck. Speaking of trucks, when the main hotels in Langley, which offered shuttles to the venue, were sold out, Pack offered me the tbird work truck to commute back and forth to work. Having grown up on a tree farm, where I learned to drive in a Ford F-350 and H2 Hummer, I was elated. The team at tbird will literally give you the shirts off their backs. In fact, on my way to the airport, they did indeed give me a T-shirt. When I was cold (wimpy Floridian here), suddenly a tbird jacket was in front of me. I was kept busy—just how I like it—at tbird, doing everything from broadcast commentary to social media and writing press releases, and I’m really proud of the work my incredible team put forth. I can compare my job to show jumping; while it may appear, on the surface, to be an individual sport, it is such an enormous team effort behind the scenes, and so much goes into what you see in the show arena! I must thank not only Chris Pack and Jane Tidabll, but also their technical and broadcast teams; Carley Sparks of Horse Network, who also ran the press office; Emily Penn, who helped with just about everything and whose smile lights up a room; the lovely Cassandra, who drove me here and there before I took over the tbird truck; IMG, including Peter Clayton and my FEI TV co-host, Spencer Sturmey; the super team at Hippodata; Longines, especially the affable Ian Charbonneau; and Connie Sawyer, my partner in crime on the North American League, to whom I owe so much! On to the competition. There were four five-star events. Brazil’s Rodrigo Lambre began the week by topping the Welcome Stake with Mario Onate’s Chapilot. The gelding had some extra incentive. His rider told him that if he won, he wouldn’t have to jump the rest of the week! Lambre kept his promise! Ireland’s Conor Swail topped the North West Rubber Cup with rising star Domino van de Valhoeve, whom Swail believe has the potential to jump Championships. Another Irishman, the young Daniel Coyle, won his second five-star grand prix of 2018 with the incredible Cita. 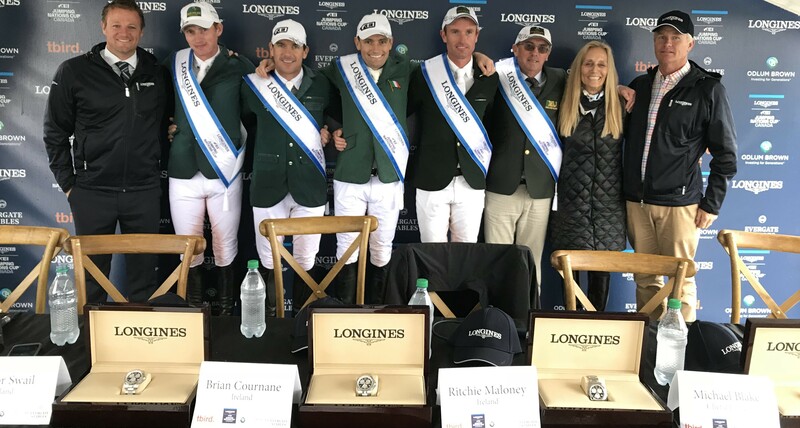 And in the main event, Swail and Coyle joined teammates Captain Brian Cournane and Richie Moloney for second respective five-star wins in the main event, the $400,000 Longines FEI Jumping Nations Cup of Canada. After the class, the Irish men counted the Longines watches they’ve received over the years from big wins. The tally: Richie Moloney and Conor Swail estimate they have somewhere between six and 10; Chef Michael Blake held up four fingers; and Daniel Coyle said he has three (He received two during the week at tbird alone!). So, who stood out most to me? Capt. Brian Cournane. Cournane is a real Captain, having been a member of the Irish army and riding at the Army Equestrian School in Dublin. Cournane is a former elite event rider turned elite show jumper. He rode a very difficult course set by Peter Holmes (CAN) with just a single time fault in the first round with his family’s 10-year-old gelding, Dino. He’s married to another former event rider, Julian “Jules” Cournane (formerly Stiller, whose parents own many of Brian’s horses). Congratulations on your first Longines victory, Capt. Cournane! How about a young rising star? The 14-year-old Canadian junior rider Anya Bereznicki won the CSIOJ Junior Grand Prix and is, without question, the most well-spoken 14-year-old I’ve ever interviewed. Bereznicki described herself as “still quite green” at the 1.40m level, but it didn’t show. She was the only double-clear of her division’s grand prix as well as the only member of her team to jump double-clear in the CSIOJ Junior Nations Cup. She was also the youngest member of that team. And for horses…watch out, world, for Belo Horizonte, Ashlee Bond (ISR)’s new ride, who debuted in CSIO5* competition at tbird with a runner-up finish in the Welcome Stake and a top five finish in the following day’s North West Rubber Cup. This horse can jump and is F-A-S-T! I must thank Ashlee, who, along with Canadians Chris Surbey, Keean White and Tiffany Foster, for taking a few moments of their days to chat with me on some of the live stream. We had some great conversations! I truly love what I do! Next stop: the oldest horse show in America, the Upperville Colt & Horse Show! 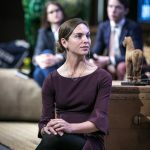 Catie Staszak is a multimedia sports journalist, working primarily as the lead show jumping broadcast analyst for the Longines FEI Jumping World Cup™ North American League. Staszak leads broadcasts from top horse shows and show jumping events across North America, working with FEI TV, the NBC Sports Network and Carr-Hughes Productions, and CBS Sports Network, among others. A competitive equestrian of more than 22 years, she has also worked on the TV and radio teams at ESPN West Palm and moderated at the international FEI Sports Forum in Lausanne, Switzerland. She strives to use her varied experiences in both the horse industry and broadcasting to help increase the exposure of equestrian sports.